It speaks loudly about how campaign contributions carry the freight in Sacramento that there's a possibility the Assembly will trample all over grass-roots democracy before the weekend is over. An important vote is scheduled for Saturday. 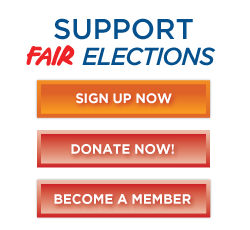 By passing the DISCLOSE Act, the Assembly could shine a bright light on the gobs of secret donations darkening our elections since the infamous 2010 Citizens United ruling by the U.S. Supreme Court. The Senate has already passed SB 52, which was authored by Sens. Jerry Hill, D-San Mateo, and Mark Leno, D-San Francisco. But the word being circulated by good-government groups and other supporters of the bill is that Democrats in the Assembly are wavering because of pressure from powerful opponents of the legislation. These opponents include the Service Employees Union International, the California Teachers Association and the California Labor Federation. What would the DISCLOSE Act do? It would bring greater transparency to ballot measures by requiring that political ads aired on television prominently disclose the top three original funders. All print ads and mailers also would have to clearly provide the top three original funders and the name of the committee paying for the ad. In radio commercials and on robocalls, there would be a clear announcement of the top two original funders. That's right, no more speed readings that sound like the frenzied, often unintelligible disclaimers at the end of car sales commercials. California's voter turnout is declining in part because people feel that their voices are drowned out by big-money interests. Putting SB 52's sunlight on ballot measures will enable voters to identify the true sources of funding and unmask those who hide behind misleading or patriotic-sounding committee names. The shame of it is, this legislation should have passed the Legislature and landed on the governor's desk last year. But, as we in California know all too well, there are many Democratic lawmakers who genuflect to the union label. With SEIU, CTA and other labor groups opposed to more transparency in political advertising, SB 52 could falter again. We are calling on all Assembly members from the San Joaquin Valley - Democratic and Republican - to support the DISCLOSE Act. If, in the post-Citizens United era, there is no easy way to stem the tide of unlimited money in elections, voters and their elected leaders should insist upon the sunlight that SB 52 delivers.